Protect your animals from ticks. It is well known spring and early summer are peak times for tick activity, but there is also a second peak of activity in autumn. The tickborne diseases of sheep are usually transmitted by one type of tick – unsurprisingly, it is the sheep tick, ixodes ricinus. Caroline Robinson, veterinary investigation officer at SAC Consulting, says these can be difficult to spot on sheep, as they start off very small and dark and usually attach under the armpits or inside the thighs. Louping ill is a viral disease which can affect most domesticated species and man. However, signs are most commonly seen in sheep. Sheep may be found dead or may present with unsteadiness, difficulty walking, disorientation and paralysis. They do not always show a raised temperature. All ages of sheep are susceptible, although it is most often diagnosed in lambs and yearlings. Not all infected animals show illness. If you suspect louping ill, blood sampling or preferably post-mortem examination may be of use in gaining a diagnosis. Mrs Robinson says if louping ill is confirmed, a vaccine is available or a tick control strategy alone may suffice where cases are only occasional. This disease has been less widely publicised than louping ill, but can be an important cause of abortion or can be associated with outbreaks of other infections due to its attack on a sheep’s immune system. Mrs Robinson says: “Clinical signs are not always obvious, with affected sheep showing a high temperature and sometimes some depression or mild coughing. “Abortion storms may be seen if affected animals are pregnant ewes. Lambs may show severe joint ill or internal abscesses due to secondary infections or there may be a spike in losses due to pneumonia or listeriosis. “Recovered animals can harbour the disease organism for a couple of years, providing a source of infection for more ticks to spread the disease to other sheep. “There is no vaccine, so management of this disease should involve tick control and grazing management. Avoid use of particularly tick-infested pastures for pregnant ewes or ewes with young lambs at foot. Instead, try to use them for ewes during non-pregnant periods, for example. This is the name given to a systemic bacterial infection of lambs, which is usually associated with the temporary damage to the immune system caused by tickborne fever. With tick pyaemia, the bacterial infection gets into the bloodstream around the same time as tickborne fever, and as the tickborne fever suppresses the immune system, the bacterial infection runs rampant, causing crippling joint ill, internal abscesses or meningitis. If you see an outbreak of joint ill in lambs, diagnosis of the type of bacteria involved may be useful. Some causes of joint ill are due to infection early in life with a different bacteria which is not tick-related. Ticks can carry diseases which can be serious for humans. It is particularly worth making yourself aware of the early signs of Lyme disease. Keeping a tick hook handy in the boot room for use on both human and canine farm inhabitants is a simple way to remove a tick quickly and safely. 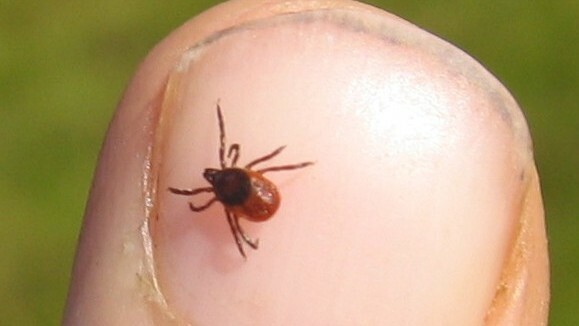 The less time ticks have to feed, the less chance of any transmission of infection.